Welcome to Fish Window Cleaning Scottsdale! We serve Scottsdale, Paradise Valley, Fountain Hills, Cave Creek, Pinnacle Peak Village, and Reata Pass, AZ! We are your local window cleaning professionals and we are ready to serve your home or business! Call (602) 441-2566 to schedule a free on-site estimate! We also serve commercial and residential customers in Phoenix, AZ! Click here to visit our Phoenix website. 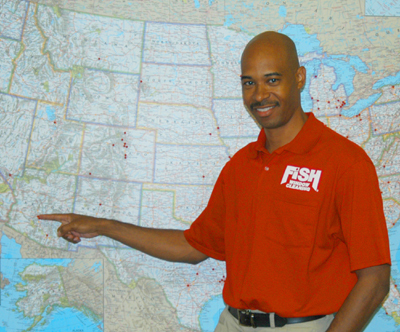 Fish Window Cleaning pledges to provide superior service to each of our customers. We are committed to your satisfaction. Don't spend anymore of your precious free time trying to clean all of the windows in your home. It's very difficult to make them completely spotless, it can take a whole day, and it can be dangerous. We can make all of your windows spotless and beautiful quickly so you can actually enjoy your free time - and, of course, you're newly cleaned windows. You can trust us to keep your schedule, stand behind our work, and provide the best value in window cleaning. Our team has been trained to provide the highest quality service and we are friendly, trustworthy, and we even wear uniforms. We are respectful of your home; we wear clean shoe covers and use cloth pads under your windows to protect your floors. We even introduce you to our team before we begin cleaning so you know exactly who is making your windows sparkle! Who cleans your windows right now? It could be you, your employees, or even a different company. You and your employees are probably tired of worrying about all of those smudges and fingerprints all over your windows and glass doors. It's almost impossible reach the tops of those large storefronts windows without the right equipment. It's incredibly time consuming. You have more important things to focus on. Perhaps you're looking to replace your current window cleaners. We maintain the appearance of your windows all year round and you can count on us to be reliable. We are insured and bonded for your protection, our cleaners' protection, and added peace of mind. We understand that different businesses require different services so we customize our programs to meet your needs, budget, and schedule. Fish Window Cleaning is the largest window cleaning company nationwide and we are committed to your satisfaction!